It was a long night – the North West was the last English region to declare their results, partly I understand due to a re-count in Trafford. 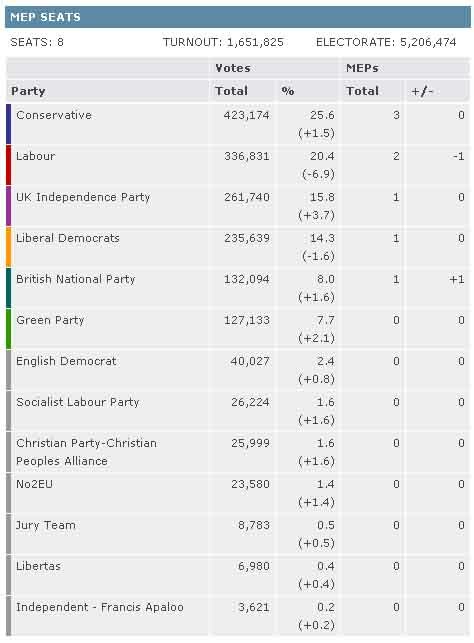 I think the North West result mirrors the UK as a whole for the Lib Dems, we held our own (lost a little, perhaps 1%) but Labour took a mauling, mainly at the hands of UKIP. Sadly, the BNP elected Nick Griffin in the North West and 1 other in Yorkshire & Humber – I saw a press conference from UKIP this morning stating that if UKIP had managed 900 more votes, Griffin would not have been elected. A real shame the BNP were able to take advantage of a protest vote. On a more positive note, Chris Davies (one of the most hard-working MEPs) was re-elected which is great news. Well done Chris and the team – it was a late finish, but worth the wait! 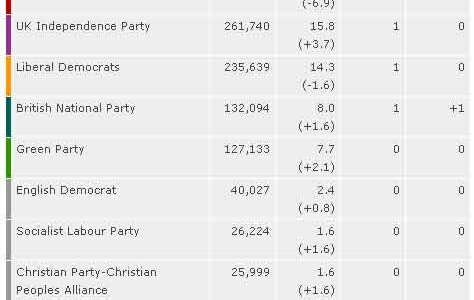 Might be worth hunting down when you have a minute – somewhere on the BBC website this afternoon I read a report that the BNP hadn’t actually made much of a gain in the North West. The reason they were able to win a seat here was because the turnout was low. Low turnout means that their share of the vote increased to (only just!) 8%, which gave them a seat at the table.